Pugs are notorious pee bandits and may poop inside too, as in Kilo’s case. They have small bladders and are quite low to the ground so, in my experience, they are often not that keen on going outside in the snow or rain. 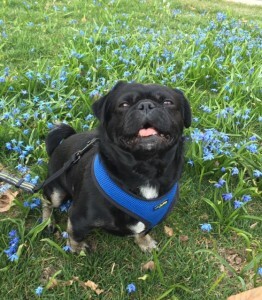 When we first started fostering Kilo the Pug, he was not really trained to go outside and he liked to pee every two hours and mark anytime. He may have been encouraged to pee on a bathmat or a pee pad in one of his four previous homes and he had only been neutered a few weeks earlier by the rescue. He stealthily peed on white bed covers, on pale bathmats, on the white carpet, and on pee pads. My first stop was to the vet, who checked his blood and urine for any health issues. He seemed fine. Next stop was to consult experts, including trainer and founder of Who’s Walking Who Dog Training Centres, Gillian Ridgeway. After two years of hard work and routine, Kilo is pretty good now, especially if the weather is OK. Initially, we went out every two hours for a quick walk, but now he can hold it for a bit longer if needed. He pees pretty well on command outside and he lets me know if he needs to go. We still have the occasional accident or rebellion if I do not take him out enough, but otherwise, he is on a good schedule. If you notice your pug doing these things, you should take him or her outside or to your designated spot as soon as you can! The majority of pugs naturally keep their crate area clean, so crate training can be a good way to stop accidents and marking, especially at night. When choosing a crate, make sure it is a comfortable size, one that is large enough to spread out in but not too large. Kilo’s has a memory foam base then a little comfy dog bed he likes to curl up in in the back half. He has a few toys and treasures and always gets rewarded when he goes to bed. He has grown to really LOVE his crate to sleep in at night or if he is stressed. The only issue is he now guards the treasures he has hidden in there so I can not reach in if he is there. He complains loudly on the very rare occasions that I lock him in during the day when we are home (eg. for a repairman or visitor) as he feels he is missing out on action, but takes himself off to bed at night. When you leave for a few hours or put them to bed in the evening, the crate can be a comforting safe haven for your pug. I find it is the best way to keep Kilo the Pug out of trouble when not under my watchful eye or at night. A good rule of thumb for crating your puppy during the day is one hour for every month of life, plus one. This means if your pug is three months old, most pugs can be left for four hours. Overnight is different, as they are less active. Most pugs can sleep in their crate about seven to eight hours at night. 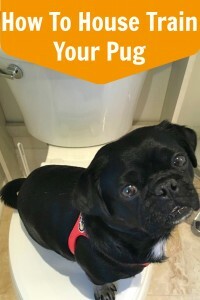 The bladder of your pug will develop as he matures. Pick a spot and stick to it: puppies and pugs need routine. First thing in the morning, let your pug out of his crate and get him quickly into the back yard or street for a walk. Keep him moving and then praise him when he eliminates. This is not the time to shoo him out and go back to your business. You must supervise! You need to know what is coming out, and how often to keep your schedule working. Then take him to the same spot on a regular schedule. 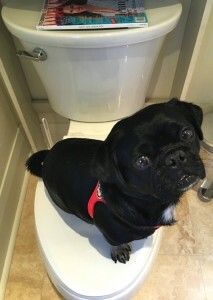 I also have pee pads strategically located in places where Kilo the Pug likes to pee, like our bathrooms, just in case he has to go and I am out or don’t see the signs or it is raining heavily and he really won’t relax outside. He uses them very occasionally now. Give your pugs lots of encouragement and rewards (like treats and petting) every time they get a behavior right. Your pug will learn what is expected of them and what behaviors won’t get rewarded. I used to say or ask “Pee Pee” and or “Poo Poo” over and over walking and then reward him with “Yes Pee Pee” and treats and pats when he went. My husband found it rather funny seeing me walking up and down the street saying “Pee Pee” then celebrating each time. Kilo now knows both “Pee Pee” and “Poo Poo” and goes mostly when asked, every few hours. He likes my approval and has his routine. We play a quick game when we get back inside as he always has a burst of energy after a walk and potty and likes to Zoom and Play. I also reward him if he uses the pee pads, even if later. He seems to connect. Keep to a regular feeding and potty break schedule right from when you first bring your pug home. Most pugs and puppies spend much of their days sleeping. But they need to head outside for urination after each nap, especially when younger or senior. Start to watch your puppy or your pug’s natural play and sleep times to know when he needs to be let out. Provide lots of opportunities for your pug to eliminate outdoors and not indoors. If you do happen to come across an “accident”, do NOT blame your pug. Some “accidents” may be your fault for leaving your pug too long, or breaking the routine. Do not scold, use violence or punish your pug. Your dog won’t make the connection and will only learn to fear you. Instead, learn from your mistakes. We all let down our guard sometimes, so just try to do better next time. Clean the area with a product specific to this use. But be cautious of products containing ammonia – they smell a bit like urine and may attract the dog to eliminate there again. Luckily for me, bath mats can go in the wash so we don’t worry. Interrupt him and take him quickly outside to the proper place. If he eliminates outside, praise him. Remember supervision and positive reinforcement! You can use an indoor tether or leash to keep him from wandering away, but be sure to always supervise. I even thought about teaching Kilo to use a toilet after seeing one at a pet expo. It’s a fun trick but not ideal for daily use as he jumped into a toilet that did not have a cat seat. 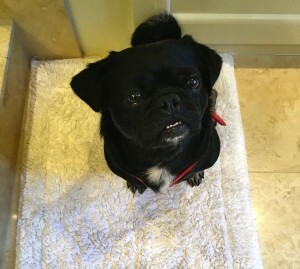 Luckily I was right there (he is my velcro pug so he follows me into the bathroom). Housetraining your pug will require the entire family to be consistent, and for everyone to be patient while he or she learns what you expect. 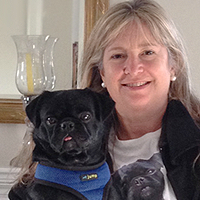 Most pugs do want to do the right thing most of the time, especially for rewards! Share your potty training tips below.